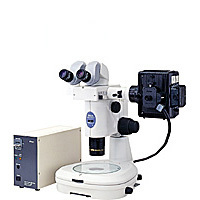 *: As of January 2000 for a zoom ratio in stereoscopic microscopes. Patent pending. Equipped with Trinocular Tube and Diascopic Stand ?The SMZ1500 is equipped with condenser lenses that can be switched for use with high- or low-magnification objectives. Furthermore, in response to user requests for high-contrast illumination for transparent specimens, Nikon developed the Oblique Coherent Contrast (OCC) illumination system, allowing colorless and transparent specimens to be observed in high relief. Performs observations of living cells under the fluorescence method.